In '92 this abstract watercolor/acrylic received an award by Catherine Chan Lui. 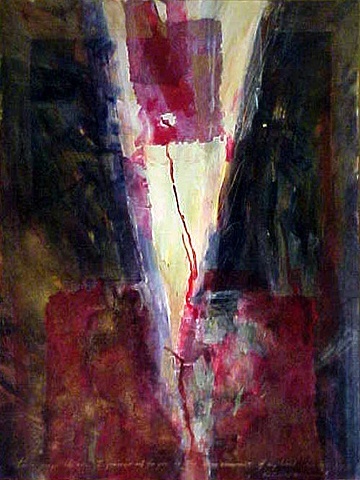 It is still in my collection because it represents a turning point for me...a biblical theme/ event painted abstractly . I had been painting live models of Christ each Good Friday with UNCA's life drawing class between 1985 to 1991 and had produced 12 paintings. I was struck by the concept that the God who is Spirit and flesh brings together the seeming dichotomy of abstraction and realism.